Liverpool FC fans… We’ve had a rough month… okay rough 2014-15 campaign. That result against Newcastle at St. James park did not make waking up at 5:45am PST that much fun. Win, tie or lose (…although I think we all agree we would prefer a win), LFC is in my my veins. No sleep on match day mornings has been part of my weekend mornings since I came back from studying in England. Even with the rough run we’ve had in the league as well as the Champions League and the Premier League campaign, I still love hearing the Liverpool songs chanted by the supporters. Whether it’s at Anfield or on the road, the support echoing around the pitch always made me proud to be a Liverpool fan. This entry was posted in About Us, Anfield Shop, Champions League, Fans, Free, Liverpool Fan, Liverpool FC, New, New Season, Steven Gerrard, The Anfield Shop, Uncategorized and tagged 2014-2015, Anfield, Anfield Shop, anfield shop blog, Brendan, Brendan Rodgers, Champions League, Collecting Liverpool FC, Daniel Sturridge, ECL, EPL, Gerrard, Kop, kop choir, LFC, LFC California, Liverpool, Liverpool FC, Randy Villarba, Rodgers, Steven Gerrard, Sturridge, Warrior Football on November 3, 2014 by Randy. Win The Shirt Off Our Back! King Kenny has the mighty Reds in fine form lately winning at Arsenal for the first time in 11 years, and today putting 3 goals on Exeter in the second round of the Carling Cup to advance. Every Reds player talked about needing a strong start to the season to achieve a European place next season and it is coming to fruition. 1. One submission per person. 2. Contest entries must be made on this blog entry to be eligible. 3. Contest closes at first kickoff of the Liverpool FC vs Bolton Wanderers match. 4. You must pick the Final score for the match and who scores for Liverpool and what order they score in. 5. In the event that a tie-breaker is necessary, the entry that is submitted first will be the victor. Good luck, and happy guessing all! This entry was posted in Free, Liverpool Fan, Liverpool FC, The Anfield Shop, Twitter on August 25, 2011 by christopher. The Anfield shop will be in attendance at Doyle’s Public House for the match Vs Newcastle at 8am. This match marks the first time Andy Carroll will face his former teammates in a Reds shirt. 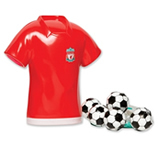 This will give you the excellent opportunity to get some great LFC merchandise at a great price. It also gives you the opportunity to win a $25 gift card to Doyle’s! Details: The first person to spend $20 on Anfield Shop merchandise will receive a $25 gift card to Doyle’s Public House. Use it as you please buy multiple rounds of Guinness, or partake in Doyle’s awesome food. Have you taken advantage of the Super Sale item yet? Supplies are limited people, don’t miss your chance. Try and find it cheaper elsewhere, we dare you. This entry was posted in Anfield Shop, Doyle's Pub, Free, Matchday, The Anfield Shop on April 26, 2011 by christopher. We were looking forward to ending our LFC withdrawals with today’s match against Blackpool…but the winter weather strikes again! Instead, we’re offering a post-holiday bonus to our customers. This entry was posted in Free, Souvenirs on December 26, 2010 by anfield.